Computer eye strain is an unfortunately common part of 21st-century life that can do long-term damage to your vision, not to mention causing sore eyes and headaches in the short term. Recent studies have shown the bluish glow of our screens also reduces the body’s melatonin levels that we need to naturally sleep, causing people to stay up later and have more difficulty falling asleep when they do go to bed. Doctors often recommend taking breaks from looking at your screen to prevent eye strain, but not everyone is so good at sticking to schedules on their own. Here are eight free web or mobile apps to help keep your eyes healthy and pain-free! Awareness is a free app for Mac and Windows that gets you to take regular breaks without getting in the way. It’s super inconspicuous as far as these apps go; it sits on your menu bar while you go about your business, quietly counting the minutes until your next small break. You set the time limit for chunks of uninterrupted work yourself, as well as how long your breaks are. Once you’ve been at the computer for your set amount of minutes, Awareness plays the steady tone of a Tibetan singing bowl to let you know it’s time for a break. And it actually makes sure you take that break by monitoring your app/browser usage for those minutes, but doesn’t lock you out. This is probably the simplest, easiest app to use if you’re looking for break reminders that get you to actually do them without being intrusive. I installed this app a couple years ago on my laptop and have used it ever since. F.lux adjusts the glow of your monitor based on the time of day; not just brightness, but tint as well. Without that glaring blue glow, I actually have to go to sleep at a reasonable hour because I get sleepy. Which, ya know, is supposed to happen! F.lux has an incredibly detailed list of research on this issue here. It’s an easy install and it runs on a bunch of operating systems. This is probably my #1 recommendation from this list. One of the most popular apps out there is ProtectYourVision. You can customize its break plan, though the default “20-20-20” plan is a commonly used technique with many supporters. ProtectYourVision beeps when it’s time for your break, and temporarily blacks out your screen for those few minutes. So, it’s a little disruptive in that way, but you can choose not to take a break when prompted, meaning the screen won’t black out until you say you’re on your break. If you really need to, you can override the break-time blackout as well. Plus, the app gives you suggestions for eye exercises to do during your break, and it has an adorable robot mascot. Since F.lux has a version for iOS but not Android, I found this app that has largely positive reviews from its users. Twilight also operates based on research done on the effects of blue-tinted light on the circadian rhythm and overall quality of sleep. The developers also cited special interest in research showing people who used a tablet or smartphone for a couple hours before bed fell asleep about an hour later than those who did not. So if you have a mobile device that runs on Android and want to employ this technology to protect your eyes and stop having trouble getting properly sleepy, get Twilight. Time Out is exclusive to Mac and is a good app for those who aren’t sure how to space out their breaks. It gives you a set break plan that involves 50 minute chunks of working with 10 minute breaks, as well as “micro” breaks throughout your work time, 10 seconds every 10 minutes. (They can still be customized, however.) The micro breaks are helpful for those who find themselves unintentionally tensing up as they work, giving you a brief but consistent reminder to relax your muscles and adjust your posture. If you only want one kind of break, you can disable either of them. The breaks will fade your screen to let you know it’s time, and then fade back in when the break is over. If you like your apps connected to your browser for a little extra convenience, eyeCare is a Chrome extension to help remind you to take those eye-resting breaks. Like ProtectYourVision, this app recommends the 20-20-20 plan, but you can of course customize your schedule. Regularly schedule breaks for your eyes is the most frequently recommended method for preventing eye strain. The extension also gives you instructions for eye exercises. It’s a one-click install, and it has a 4.5/5 star review by users. This is another Mac-only app with a unique approach. Nocturne is an older display-altering app to reduce eye strain, but it does so by giving you options to change your display via using a monochrome scheme as pictured above, inverting colors, disabling shadow effects, and adjusting tints. You can adjust screen brightness as well. Again, it’s a somewhat dated app, but it is free and offers a unique approach to reducing eye strain at night. 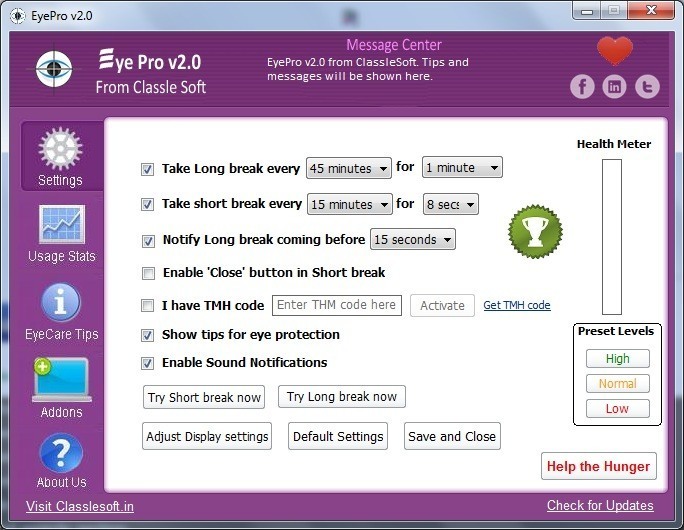 Eye Pro is a Windows app that seeks to reduce eye strain but also focuses on keeping your eyes properly moisturized. Not satisfied with only preventing eye strain, the developers designed the app to get you to blink more while at the computer. Research shows that our blink rate tends to decrease significantly when we use a computer. Eye Pro displays occasional notices encouraging you to rest your eyes and blink to restore natural moisture. There are short and long breaks, which you can skip if you need to, and plenty of tips for eye exercises and overall protection.